Activity-based Model Pricing Enhancements | Resource Systems Group, Inc. 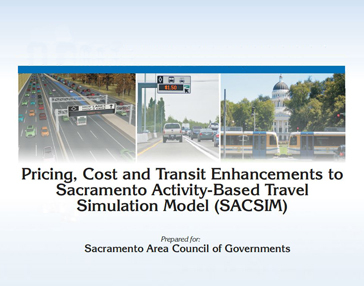 The SACSIM model system developed for the Sacramento Area Council of Governments (SACOG) became one of the first activity-based model systems to be applied in regional planning. Subsequently, SACOG analysis needs required that the Daysim activity-based model component be enhanced to represent various types of pricing policies. RSG updated the model to better capture the effects of road pricing, which can include managed lanes, cordon pricing, and time-of-day pricing. These revisions included best path skims for priced and non-priced networks, which incorporated the toll/non-toll choice, created separate network skims for various value of time (VOT) ranges, and included additional time periods so that the model can respond to time-of-day pricing in some detail. In addition, the project team implemented additional capabilities related to transit pricing, including transit passes and discounts, as well as premium versus standard services.